An Update On Our Child's Occupational And Physical Therapy Progress! You are here: Home / Therapy / An Update On Our Child’s Occupational And Physical Therapy Progress! An Update On Our Child’s Occupational And Physical Therapy Progress! I’m embarrassed to admit that our ten month old son spends way more time at the gym than I do. He works out with his physical therapist twice a week, and his occupational therapist twice a week as well. This little boy works hard! Like, super-crazy-awesome hard. I’m so proud of this little boy. We are blessed to have a team of incredible pediatric therapists working with Noah. They don’t see our son as just another patient. They actually treat him as if he was their own child and are committed to helping him reach his goals. it’s great. I’ll never be able to thank them enough for the impact they have made (and are making) in my son’s life. We have posted a lot of videos of Noah’s journey with his various therapists, and so I thought today would be a good time to give you all a little update on what he is currently working on. Learning to stay up on all fours is hard work. Noah’s physical therapist has been spending a lot of time lately using treadmill therapy to help him learn to walk. (If you’re interested we posted the treadmill training protocol for children with Down syndrome which you can download for free.) He’s come a long way since his first time on the treadmill. If your child’s therapist isn’t using the treadmill with your child with Down syndrome, I highly suggested printing off the treadmill information I linked to above, giving to them, and asking them to incorporate in your child’s developmental therapy. One part toy, one part developmental tool! In today’s video Noah’s occupational therapist is using stairs and developmental motivators to encourage him to sit up on his own. He does a great job at staying in the sitting position if we put him there, but his core muscles aren’t strong enough yet for him to sit up on his own. Even though it looks like Noah is simply playing with toys in today’s video, all that playing is actually helping him develop the strength needed to sit up, crawl, play with toys, and eventually walk! So those toys are actually developmental tools. Pretty sneaky strategic, huh? I say this a lot, but I’m super proud of our little boy. The pride I have for our son far exceeds any words I have to express it. From the second Noah was born, he’s been working hard to do things that typical children learn to do quickly and easily (and without spending hours at various therapy appointments each week.) I’ve get to see first hand all the hard work this kid puts in to reach his goals, and I also get to see the deep sense of accomplishment on his face every time he reaches one. He does it all with a smile on his face. Never complaining, and never asking for anything in return. It’s inspiring. And it’s amazing. There are no words to describe it. This is his "work out" face. Cute, huh? 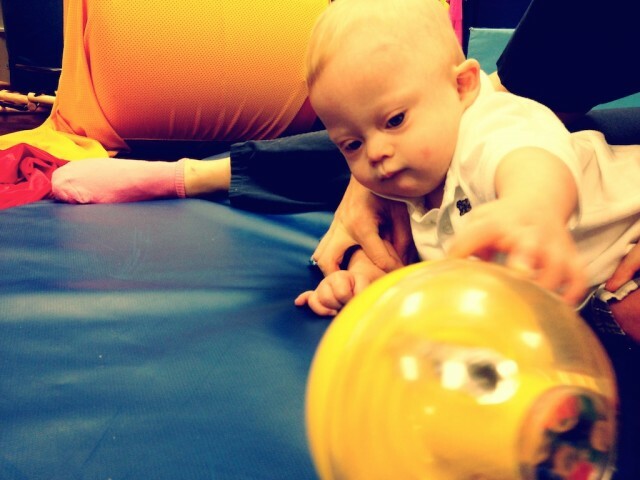 What has your child with Down syndrome been working on recently in physical / occupational / speech / feeding therapy? What’s a recent goal or accomplishment they have reached? We love hearing your stories, and are so thankful to be on this journey with you. Please be sure to leave a comment below so we can stay up to date on what’s going on in your family. And just a quick reminder: never forget that what so many of you are doing for your children is important, you may not hear it enough, but thank you for all the time you are investing in your children. We enjoy reading every one of your comments. looking at your pictures, and learning from you. Keep it up! Liam is working on “mid line” stuff and neck muscles. We go tomorrow for our 1st real OT session. @9281a76ad882e392c810bd07d572df9c:disqus Oh yah…..we know ALL ABOUT midline. 🙂 Fun stuff. We actually have a few toy suggestions that really worked well for Noah, I’ll have to get them to you. What sort of toys / exercises have you guys been doing for midline stuff? We do speech, occupational, and physical therapies twice a week, and developmental once a week. Total of four hours of therapy every week. And boy, does James work hard! He’s asleep almost the minute I strap him into his carseat at the end of a session. We’re working on pulling to standing, standing up next to a flat wall (we’ve moved away from the corner, yay! ), crawling on all fours (he’s a great military-crawler), and walking. And that’s just physical therapy! Then there’s the fine motor skills in occupational: isolating index finger and sorting circles and squares are some of his new accomplishments in that arena. And in speech, James can choose the correct items from photos and is starting to choose from drawings, too (which the ST says is cool…things I didn’t know when Caleb was this age!). My parents watched the boys while we were gone last week, and my mom saw all these therapies for the first time. She was very struck by how hard James works, and by how much he can do! You guys are doing such a great job, you should be very proud! It sounds like Noah and James are close together in what they are working on. We are several months behind in our videos, but in current day, Noah just started standing up on a flat wall (actually my aquarium stand) and a few weeks ago just decided to go from inch-worming (which we TOTALLY count as crawling 🙂 to up on all fours. It’s super funny. He has realized it’s MUCH faster than the inch worm, and has a lot of fun trying to crawl away from us. It’s super funny. What a fun adventure we’re on…. That’s fun! Noah REALLY likes the water. Do you guys do the pool as a part of her occupational / physical therapy, or just something fun to do? How old is Gemma by the way? It sounds like you are doing a great job! Tell me more about “counting the fat” going into his system….something going on that requires you to do that? We will find out tomorrow exactly what we’re working on. My guesses would be PT for neck & shoulder strength and OT for feeding issues. Sabra’s 12weeks old now (gestationally 9 weeks). When assessed for therapy a couple of weeks ago, we found out she’s doing things some 6 mo olds are just learning (rolling over, crawling, picking up & playing with toys, etc), but not doing things a 3mo old should be trying to do (lift & hold head up, looking toward sound sources other than mommy’s voice, etc). I’ve learned that there is no “average” for kids with Down Syndrome. There are so many extenuating circumstances, and some things come easy, and others don’t! 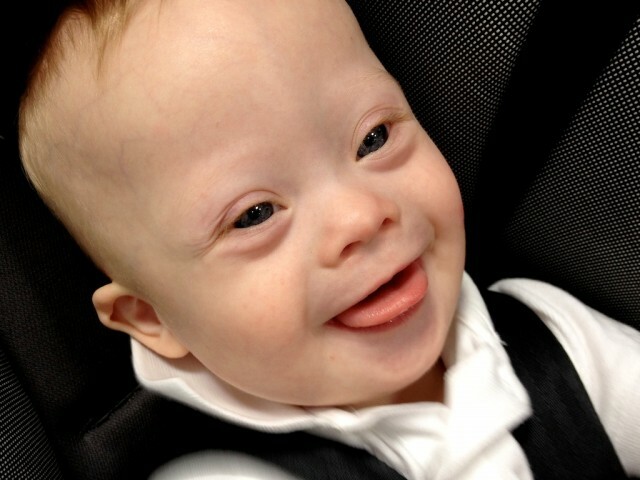 I’ve been asked so many times if James is developing within average ranges for kids with Down Syndrome. Yes, he is, but the range is so large, it hardly matters! Way to go for your little one already knocking some things out of the ballpark! Getting started on therapy felt like we were finally *doing* something. It’s a good feeling. Have fun! her accomplishments, I also try to challenge her as much as is healthy. and several friends all raved about the program. hours of play time and our physical therapy videos. We are working on getting up on all fours…towards the crawling! He just really is happy to not do it!!! We are also working on pincer grasp and putting toys in and out of containers. James loves to pull our hands and stand up, but is not pulling to stand yet, so that is also something I am trying to help him with. I know he will eventually get it, but yes, I want him too. Some days I worry we didn’t do enough “therapy” in play, but we try! A few backs Noah started getting puffs / snacks out of the container on his own. It’s SUPER cute. We just had our first PT evaluation for our 12 week old, Lila, last week. We are working on pushing up during tummy time and strengthening neck and head muscles. She is discovering her hands and starting to play with them more and more. Here’s a picture from her evaluation, where she was teaching us how to support Lila’s shoulders and hips so they don’t over-extend. How often do you guys have to go to physical therapy? Did she say when you you would start / go back? We have pt once a month until she gets a little older, I’m hoping that’s soon because I know it will only help her progress. She’s already rolling over! @42db128f5183e78f7badaa2e35109cad:disqus It sounds like you guys are doing a great job, I’m so happy to her that. That head control is such a big thing. I think I have some videos on our site when Noah was first learning to sit in his Bumbo chiar, and he was all over the place. I was sad and proud at the same time. But day by day that head control got better and better and before we knew it he was sitting up with no problem. It’s so awesome to witness this hard work first hand. Do you guys have any other children? As the mother of a typical son, it AMAZES me how much more qualified you are to be a parent than I am! Seriously, the amount of work that Noah does, and you and your wife do, is wonderful, and I think there are many parents of typical kids who would benefit from knowing all you do. My son was on the late end of “normal” for his gross motor milestones, and I hit a very, very frustrating wall in a state that is broke (California). He was not delayed ENOUGH to qualify for services, but he was delayed enough to truly make me sweat all the physical milestones. Yes, there IS a wide range of “normal”, but when your child is the one on the later end of it, it is so hard to see. How I wish that I had been walking this path at the same time as you, since you give such meaningful advice on how to work on physical milestones! My son turned 2 in January, so he’s older than Noah, but not so much so that I have forgotten what it was like at that age! I am cheering him on every step of the way! @ChrissMari:disqus As is most important work that involves shaping and equipping the next generation of leaders. Very sad. I think teachers should be one of the highest paid professions in America. I don’t agree because I don’t think we should be doing comparative values. Teachers should be well paid period–not because a bank pres or baseball player shouldn’t be paid as well as they are. I think it sets up a dangerous precedent. What if some horrible piece of legislature decided that Early Intervention Therapists should be paid based on the economic impact their clients make I the future? EI kids will likely make less “impact” than their peers. Or gifted teachers get paid more than special ed teachers because it’s “more likely their students will shape society” in the more traditonal and measurable way. I’m not saying I agree with this at all, I’m just saying it’s the dangerous road we go upon when we quantify things. People should be paid well because we all should and it’s a society we’re trying to run. Agreed! I plan to be an OT for a love of the profession and the kids, but it sometimes makes me really nervous how badly paid it is. I want to adopt some of my own special kids and I am not sure how I will pay for that! I think the worst part is the cost of schooling involved. It’d be a very comfortable working class life if it weren’t for paying back student loans. I don’t do therapy. I’m a fundraiser for a non profit. People who went into for profit work are doing very well while I’m not starving or anything but can’t afford a house or kids right now. But yeah it is hard….follow your dreams and do state schooling… it’s cheaper! As far as adoption goes, if you’re wanting to adopt in this country, check out different state programs. Some states don’t require you to be a resident to adopt. Some states allow you to adopt, provided you pay your own legal fees, some states will pay the legal fees if you’ll adopt. We’re looking at adopting from the state of Florida in the next 2-3 years. They cover adoption fees. I have two friends that, combined, have adopted 9 children from the Floridian foster program. They paid no fees at all for the adoptions. @51bcf070f555576ec3e7dcfee7b24d14:disqus Thanks so much! How old is your son by the way? Mordecai is 12mos and working on pushing himself on his own into a sitting position from laying down and also crawling on all fours as opposed to a combat crawl. He needs more upper body strength in his shoulders and more core strength. He’ll get there! Once James could get himself into sitting position, he clapped every time he did it…for weeks! I know I have bragged a few times on the page, but Syd’s latest accomplishment is standing independently! We are now a week into this new skill and I am still beaming with pure joy and pride!! I love watching her get into stand…her whole face lights up and she then claps for herself! She knows what she is doing is a BIG DEAL!! Last night my husband was working with her in stand and she attempted to take steps. She still need to work on her balance but she is getting it! I am so proud of all that she done to get to this point!! She amazes me every single day!! Wondering if you know or could ask your PT what brand their padded platform swing is? We are working on potty training. It is slow going, but we wre seeing progress. Ben will be 4 in a couple weeks, and is ready to start doing what everyone else around him is doing. We are also starting to work on reading 2 and 3 word sentences in reading and expanding his sight word base, which is in turn helping his speech. Brooks is working on sitting up with the PT but when we went for the genetics counseling appointment the doc said he’s not ready to sit up because he does not rollover from front to back and back to front. Not real sure who’s right. Also what age does the OT start. Brooks will be 8 months on 3/21. You are awesome! been following your blog for a while now. I have a son aged 7 months old. Your sharing gave me comforts.. that there are lots & lots of stuff we can do with our kid. Thank you for your sharing…please continue to do so. Love it! He is just so precious! I am so happy we live in a day when darling children like Noah are seen for what they, angels who may need a little extra help now and again. Thank goodness for wonderful therapy people! I often say how blessed we are to be in a place and time with so many resources available for children born with Down syndrome.. They are still angels, just angels with attitudes. I couldn’t agree more. Watching my granddaughter do things that “typicals” do with no problem leaves me with such a source of pride. They are truly inspiring, every day. @6e4a84548c37b75a2a29c0b4bba5d9ef:disqus I totally agree. How old is your granddaughter? What an inspiration Noah is to me…you are right we could learn a lesson from him working so hard and always smiling………:)…thank you for sharing him and the amazing journey that you and your wife are on with Noah. @b6505bab5b7113b1087d1c05765038e5:disqus Hey thanks! Do you have any children? If so, how old? My son with DS is almost 20 months and has recently began taking steps… we are up to about 7 🙂 Sooooo proud of him, thought I would do some bragging!!! Love your website, you do a great job showcasing all of Noah”s progress and hard work. @d021f295d4464759c3b8e45f85079074:disqus That’s awesome! You guys must be so proud. Noah just started walking with a toy, and it’s a ton of fun! We are in Kentucky. We are up to 20 ft. now, but he still prefers to crawl. Thank you for all that you share on this awesome blog. I haven’t read much of it (yet) but I am already impressed by what I have seen. Blessings to you, Noah, and your families! I know you probably don’t give medical advice, but I am concerned about our little girl, Sophie. She is 8 months old and the absolute cutest baby ever! Your blog has inspired us to start a blog to chart her growth and progress and of course brag a little! Anyway, she was not only born with DS but also 2 months early so she has two things causing her delays. I ave asked abou therapy and her pediatrician would rather wait until he has heart surgery (av septal defect). My concern is she will be 10 months old when that happens and then over a year old when she has fully recovered. Is that too long to wait? Our early steps program gav us a few exercises to work on, which is great, but you know us parents….I just want her to have the best! Thanks so muh for your blog, it is amazing!! I think I can answer this…. 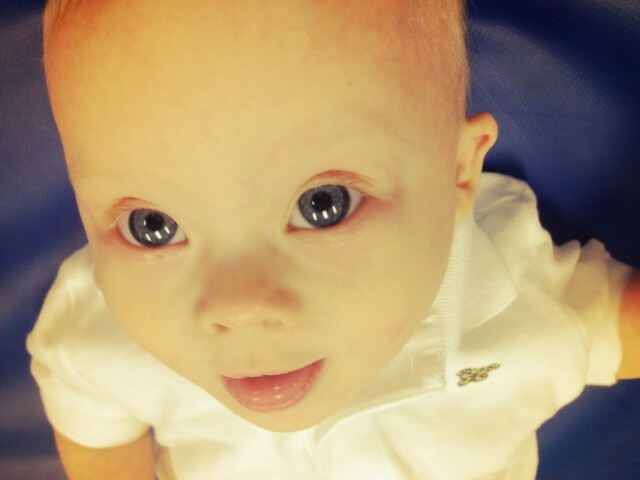 My son had VSD repair at 3.5 months. Before then, he had one therapist (developmental) come to the house once a week, but we really didn’t see much progress until after the surgery. At one year, he started OT, PT, and ST. We had wanted to start earlier, but our DT seemed to think they wouldn’t do anything he wasn’t doing. We saw HUGE improvements once he started all the other therapies, which made me wish we’d started them earlier. However, he is doing very well despite starting at 12 months. With Sophie still dealing with the ASD, she is probably doing what she can, and hours of therapy a week will only wear her out, and redirect the energy she should be using for growing! I think there is a book mentioned on this site that’s good, something about Gross Motor Skills, that gives you exercises to do with Sophie. And, like my son, starting a little later won’t be bad; it’ll just make sure she’s ready to hit the ground running! Hope that helps. Thank you, great advice! I think that might be our pediatricians thoughts. It is good to hear how others have approached different therapies. I hope your little cute kid will finally be able to recover. There’s so much in life that he will miss. I’m not sure what you mean? Recover from what? What is he going to miss?